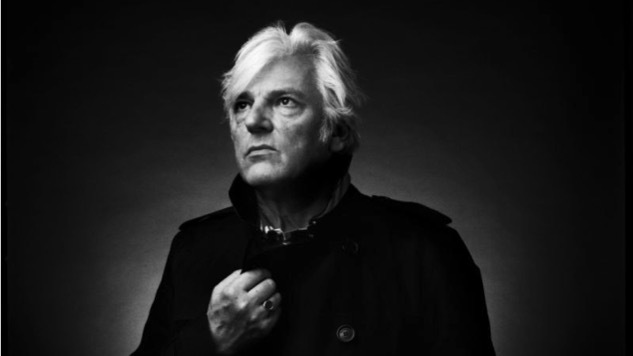 By most measures, Robyn Hitchcock is a strikingly unusual individual. His songs tend to be about ghosts of dead wives, tarantulas, wasps and other fearsome creatures that haunt our nightmares even while inspiring a curious glance and bemused reflection. He is, above all, an eccentric Englishman, whose fascination with Bob Dylan, the Beatles, Syd Barrett and others with similarly adventurous instincts helped inspire his own surreal and often psychedelic soirees back in the mid-‘70s—first with his band the Soft Boys, later with outfits like the Egyptians and the Venus 3. However, these days, Hitchcock remains a fearless solo practitioner, gray-haired but still lithe, a man who seems to defy time as he weaves his relentlessly remarkable narratives, much to the delight of his fans. Notably, Hitchcock’s anecdotal musings and tilted observations find a fit in any number of varied settings. A fortnight ago, he was playing the role of quirky troubadour, holding court at the annual International Folk Alliance confab in Kansas City, rubbing shoulders with protest singers and icons of the ages in a series of showcases. Two weeks later he’s in Knoxville Tennessee, sharing his wares at the Big Ears Festival, the nation’s foremost showcase for experimental music and sounds of heavy exploration. There again, Hitchcock provides a great fit; stunningly cerebral and dryly intent, as well as witty, pithy and unerringly articulate, his performance can be enjoyed on surface levels, although it resonates best when the listener leans in to take full advantage. Ironically, the first of two sets Hitchcock played at Big Ears found him starting by going back to his past, opening with a stirring take on Bob Dylan’s “My Back Pages,” proceeding through a delicate take on the Beatles’ “Dear Prudence,” and then re-imagining an obscure Syd Barrett song before launching into some familiar favorites and tracks from his new eponymous LP. Once his concert concluded, we took a late lunch and spoke about his verve and versatility. Paste : You seem to be a man for all occasions. Here you are at this avant garde festival featuring experimental music of all kinds, and just two weeks ago we found you at Folk Alliance in Kansas City. You’re like a chameleon that easily sheds his skin. Hitchcock: I’ve never really belonged to a genre. The only reason to belong to a genre is so that people can identify you and you become an easier product to sell. All the tomatoes are lumped together and the cheese is lumped together, and the funeral homes and the airlines…all this stuff that you know what it is. But what I am has never been clear. I’ve never found a genre that I’m comfortable in. I will cop to being psychedelic or a folkie if that will get me work. Sure, I’ll play a folk festival. I’ll be a folk singer. But it’s probably easier to define me by what I’m not as opposed to what I am. I come from a certain amount of traditional music. You have to view people like me from a distance in time, because in the end your name will be pulverized. Paste : You have such a huge body of work. Does that make it a challenge to create something new without actually repeating yourself? Hitchcock: I spiral. Time is circular when viewed from afar, but when you go around the side of it, you find it goes in a different direction. I basically go from loud to quiet. I just made a record with an electric band, which I haven’t done in a thousand years or so, but then again, in terms of sound, I only have like two and a half tricks maybe. I tend to revisit each sound after a while. I’m not going to go off and make an album entirely of keyboards or make a record with an orchestra, unless there was an orchestra I just couldn’t say no to. It’s all around the guitar, although sometimes it gets quiet and sometimes it gets a bit noisier. Paste : Nevertheless, your lyrics always distinguish you. They’re unlike anything else out there. Where do these musical scenarios come from? Songs like “My Wife and My Dead Wife,” “Madonna of the Wasps.” Incredible aural imagery. Hitchcock: I like words and I like stories. I write a lot of short stories. My dad was an author and an artist, so I grew up in nest of words. We weren’t good at football. We were all pigeon-toed and we weren’t athletic. We were quite internalized, me and my sisters. We grew up around a lot of words and pictures, so that was what was important. I listened to a lot of music. My dad liked good tunes. I remember one day he came in and said “you might like to listen to this,” and he played me the Beatles for the first time. But I knew about words long before I had any mastery of music. I had been writing poems since I was about seven. I didn’t do anything with music until I was abut 25 or 26, so I spent a very long apprenticeship learning how to put words together. What I do is probably a lot less experimental, because in a way I know how it goes. It’s like Bryan Ferry. In the beginning he was much more experimental. Paste : You are the very epitome of an ideal Englishman. Hitchcock: I am? What I am is very middle-class, privately educated and a bit bourgeois. My background isn’t all that different from John Cleese. We’re arty people. The real influence on me was growing up in the late ‘60s. I was going to a private school where I went in with Rubber Soul and came out with Abbey Road. I discovered Jefferson Airplane, the Grateful Dead, Love, the Doors, the Velvet Underground, the Incredible String Band…all of it. Everything that influenced me is what I listened to between 13 and 16. Most of what I listened to was American music, and here I am 50 years later singing “Chimes of Freedom.” The way Britain and the United States cross-pollinated back then was magical, and it made me feel like I wasn’t bound to one nationality. Paste : An Englishman in America then? Hitchcock: I think of the English mainly as a culture of grannies and thugs. I live in Nashville now. Here in the south, people try to be polite. It’s all “yes sir” and “yes ma’am.” The social skills aren’t abrasive, but that tends to take a few years to learn. Paste : Americans tend to think of Brits as very polite and very articulate, being very good with words and having a certain wit about them, qualities which you possess. Hitchcock: Morrissey is like that. Paste : And so are you. Hitchcock: That’s what I mean. I don’t think there are very many of us. I know I have a certain wit. John Lennon had that…John, Paul, George and Ringo. Paste : And again, that’s the image we have of the Brits. Very witty and articulate. Hitchcock: Well, you had Groucho Marx and Bob Dylan. Paste : It’s the way you address the audience, your phrasing…It’s a dry sort of humor. Hitchcock: Nick Lowe is better than that than I am. He’s even drier than I am. A master of irony. What you’re seeing there is the way we’re cast by Hollywood. Sort of dodgy uncles. That says a lot about both countries and the way they see each other. It’s someone like Leo G. Carroll. Slightly twee, slightly camp, but with a bit of authority. A sort of sexually ambivalent uncle. The very authority that we Brits possess makes us slightly suspect. Americans tend to be slightly spellbound by that and we can exploit that and say things in a slightly charming but cold way. Paste : The last few times we’ve seen you, you’ve been in solo mode. Do you prefer that approach as opposed to fronting a band? You’ve become the traveling troubadour. It’s almost like you’ve gone full-circle. Going back to your roots. Hitchcock: I’m not a band. I’m me. I’ve had bands, but they’ve had me as the frontman. I love playing with a band when I can afford it, but it’s a whole other thing. My new record is like that. But in terms of being on stage, it’s about 10 times easier being solo. There’s no soundchecks, there’s no roadies, no conferring with the others, there’s no relating to people. It’s just me, my ego, my guitar and the audience. It’s simple. Plus I started in the folk clubs. I’m not like Richard Thompson who started as a rocker and worked his way back to acoustic music. I started listening to acoustic music—and the Beatles—and then after playing the folk clubs, I was able to get the Soft Boys going and have a proper beat group, and really since ’82 or ’83 when I did I Often Dream of Trains, I’ve been in spirals where I alternate between acoustic and electric. Paste : So how does the new album fit into the trajectory? Hitchcock: I’ve gone back to the spiral. It’s the same place on the arc where the Soft Boys and the Venus 3 were. A bit of Underwater Moonlight and Ole Tarantula. One guitar in each speaker, harmonies in the middle. It sounds a bit like ELO. Paste : You just turned 64. How are you enjoying it now that you’re of a certain age? Hitchcock: I’m lucky. I’m still able to function and I’m living the life of someone half my age. I’m doing everything I did at 32. I was a late developer. I don’t have the gravitas of a 64-year-old. I’m not a Bob Dylan type figure. I’m not a grand old man. I’m not some seedy old folk singer either. The main thing to me is to get stuff done until I can’t function anymore. I probably seem youthful because I still have that momentum to put these things out, to write them down and perform them, but at some point, I’ll be switched off. But until that time, I will remain at the same energy level and, touch wood, my body will keep going with me.